there's a huge difference between smartphones and laptops so comparisons shouldnt be made. i prefer using laptops web browsing, games, office work, watching movies, etc. i use my smart phone for calls, texts, on the go web browsing, some movie and picture taking. Maybe in next 10-20 years later. I run vsphere,visual studio, even hackintosh to run xcode. Smartphone didn't have power to do that. And just like some comments before me that all software in smartphone was created on laptop. Not in another smartphone. Smartphone only for gaming, social network, mobile entertainment not for heavy graphics game, heavy office work but laptop capable to do anything. The only disadvantages from laptop is the size. i'm typing from a 7 years old Toshiba Satellite A 100 with Intel Celeron M440 1,86 Ghz and legit Windows 8 Professional. well my friends have used my phone more than my desktop computer, thats why it is called "PERSONAL COMPTUTER"
I have always wondered how much close smartphones are getting to the PCs and laptops in terms of processing power.....this article answers that. Now Intel has competition from cross-platform devices too..
Days NOT too far when fruit is the only thing left to be named apple..! Smartphones will never replace laptops. No matter what advanced features the smartphone has but the benefit of having a large screen (at least 14-inch) and a hardware keyboard is important in doing graphic/media editing stuff, document creation, and browsing the web. I think it's the tablet that has the potential to replace laptops in the future when their OS becomes as powerful as Windows and Mac by that time. Can you do professional graphics designing and video editing on a smartphone? Can you process company workers' payroll on smartphones? Smartphones are only for play. Laptops are for both work and play. Haha. This in not right. 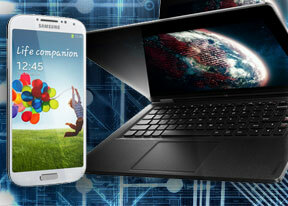 Smartphones have simply out classed the laptops and specially the S4. But people tell me, on which device, the S4's software was encoded..?? Was it a google nexus, or S3 or what...?? PC or Mac are the one man army. They are the Fathers of smartphones, and father is always father. Smartphone users vastly out number desk-top users. Our user pattern has changed. Mobiles can't come close to the experience you have with laptops, despite higher resolution or at least higer pixel density of phones. But we make do with small phone screens for surfing the web and watching streaming video. I wouldn't really pick up a laptop as many times as I pick up my phone and connect it to do some surfing or streaming. When it comes to mailing, IM's and so on, I rarely use my phone. And when I do, I write a lot less. I strongly believe that people write a lot shorter texts due to the fact mobiles has taking over so much of hour surfing habits. And I dont think that it's beneficial for the world. Using a phone as a camera, instead of the camera you wouldn't have with you, is hovewer enriching the world, so it's not all bad. I really hope the upcoming tablet generation will have a lot of people returning to using larger screened devices for surfing, and that a lot of them comes with dockable keyboards, so people get back to writing longer and more giving texts. I think some of you are under estimating what's to come. In a couple of years everything will be on one device. Your phone will be your computer. You simply connect your phone to a screen and keyboard one you need to do productive work. Then you disconnect and leave with your phone. Get back home and connect it again. Processing power and graphical performance will be with par with what you would expect from a computer. Once organic materials are used as hardware, there will be no limit on data storage and power. Eventually everything will self integrate with our body and surroundings, but I think none of us will live to see this happening. kk, 10 May 2013Smart phones are pocket sized laptops .so I don't need a laptop. So can you make music, edit video, make a supercool animation video clip,coding, enjoying os's like window's mac's and linux, play games (such as skyrim,crysis,halflife,deux)or have a professional life? Then it's gonna be Microsoft turn to go bankrupt since lately they really really doing their best to go in that direction the bankruptcy direction. They design every new OS to be a resource hog to make sure that every new program will run slower than on the previous OS version. Then they integrated the famous repulsively ugly and inefficient Metro interface into the desktop version of the OS. Looks like Microsoft is really that stupid they developed Metro for Zune which became obsolete they integrated it into the Mobile version which will became obsolete really soon once Nokia will go bankrupt and now they integrate it into the desktop version just to make Windows obsolete. Once Windows gets obsolete Microsoft will get obsolete since users don't care anymore about the OS they only care about the content they have music, pictures, movies and some games and the first 3 you can port and watch on any platform even games aren't OS dependent anymore since they get ported to other OS'es. So yeah Microsoft your OS just became useless, I don't play games anymore on your OS since life is a better game to play on than a PC game so I'm not dependent on your OS anymore, so from now on you can develop the most ugly inefficient and repulsive OS you can imagine since no one will gonna buy it anymore. I believe you guys have nothing to do in the freetime and make such a review. But it is a welcome, for enjoyment and informative reason at leats. Can you survive with 14 years old dumbphone like Nokia 8850 with a super highend & hightech laptop, with monster specs and lightweight? Mac or PC anything, you name it, OS is a matter of preference. Can you survive with 14 years old laptop with latest flagship highend smartphone, phablet, or even tablet with latest version of OS? As far as I know Mac or PC can stand alone for doing anything. OS upgrade & downgrade, reinstall OS, changing OS, anything... It only needs CD Rom and CD with OS files content. Smartphones, phablets, or tablets are computers dependence. I'll be purchasing a shiny new ultra-book in a few months time. Most people hate typing on a touchscreen, which is why the old form factor will never die out completely. What laptops really need is predictive text. "Desktop software is still way ahead in terms of flexibility or real productivity: it will be a while before writers, accountants, architects, designers, software devs, photographers will be able to their job on a phone or tablet." the above carries the fuel for fire which would even make the smartphones smarter in coming days or months unleashing the performance of them outwit the laptop and desktops making those to be monument in a museum. Laptop will stay with us for a long time. Tablet and smartphone is intended for a media consumption device. But laptop is still better in media productivity. Even if you can attach keyboard and mouse to a tablet, the OS nature (Android iOS you name it) will reduce the productivity nature of the device. Never that i can remember, when i can directly copy and paste from app to app with just changing my viewing focus to different app window, not switching apps like a stack of cards. The only viable Laptop replacement is the Microsoft Surface Pro i think. But the hardware and power consumption is still not mature enough for a tablet definition, still needs more refinement.